Encouraging news today from North Carolina. 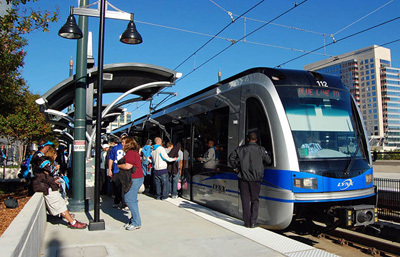 Mary Newsom at Network blog Naked City reports that local, state and federal officials signed an agreement yesterday for a 9.3-mile extension of Charlotte’s Lynx light rail system. When completed in 2017, the Blue Line will connect the far-flung campus of UNC Charlotte, with its 30,000 people, and a population center of 750,000 in “the heart” of the Queen City. The signing of the full funding grant agreement, as it’s called, is something of a formality, but its significance can hardly be overstated. FTA Administrator Peter Rogoff, in town for the event, predicted ridership on the Blue Line would double. I think that’s underestimating it. Charlotte is home to a major state university, yet the university, for much of its existence, wasn’t physically integrated into the rest of the city. That has been changing in recent years, and with the new light rail line it will change dramatically. Students will be able to travel easily from campus — where the station will be near the Student Union and a large cluster of dormitories — to South End, uptown and points in between, notably the NoDa neighborhood of bars, restaurants and renovated mill houses … And people in other parts of the city will be able to travel more easily to the main university campus without having to fight interstate highway traffic. Also today: The Chicago bike-share station siting map is live, public meetings are coming soon, and Grid Chicago has the details. Biking Toronto passes along news of the $20 cardboard bicycle that “could change the world.” And the Florida DOT tells Transit Miami that pedestrians’ fear of motor vehicle traffic is all in their heads. How Can Cities Succeed in State Budget Negotiations?